We have been making bread for more than 70 years. We believe that good bread should be very delicious and, at the same time, it should make us feel complete, energetic and happy. Therefore, we created the real whole-grain bread, in which we combine all the beneficial properties of the whole grain with its rich and characteristic taste. We use high-quality whole-grain flour for Vita bread. We select the best grain cultures and grind them in our own mills. This is how we make sure that all the essential and valuable properties of the grains are preserved. There is a reason why our mills are made of stone – this is an ancient classic technology that does not destroy the beneficial elements during the grinding process. This method is slower and more expensive, but nothing is more important for us than keeping the natural richness of the whole grain. We create Vita bread for the modern people with high demands to high-quality and healthy eating. Good food is botha pleasure and the most natural way to take care of ourselves and our families. Our master bakers make bread with this special attitude toward food. For this reason, they work in cooperation with experts in healthy eating and dieting. The recipes they have developed combine the traditional art of baking delicious bread with the skill to take the best from nature. “We wanted to get to know and inspire people to choose a healthy and balanced diet with this initiative, by focusing not only on their life, but also on the life they create. 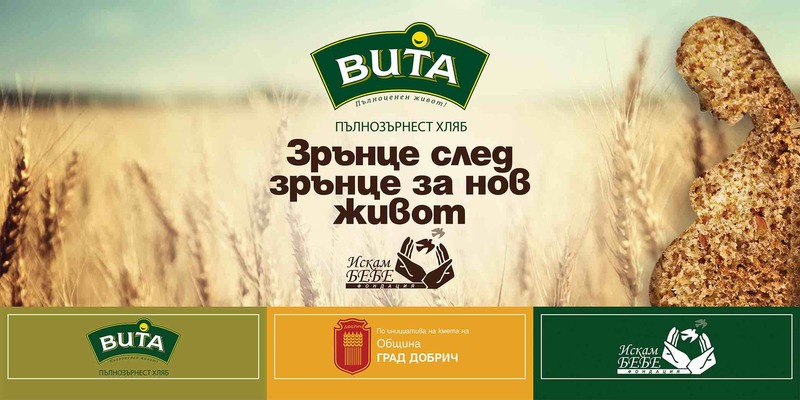 The proceeds from the sales of Vita whole-grain bread varieties (BGN 20 000.00) will give 5 couples with reproductive problems the chance to make their dream come true.